Pilots arriving at Washington Reagan National Airport have a new set of waypoint names to learn, but they may not mind so much. Transportation Secretary Ray LaHood announced Tuesday that the FAA's Washington Metroplex Team has named two arrival sequences to Ronald Reagan Washington National Airport to honor those who died on September 11, 2001, and those who have served our country from that day forward, according to a post appearing on the DOT blog. 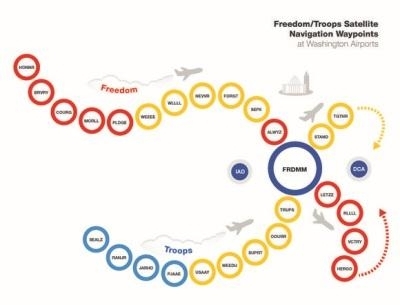 Each arrival sequence, FRDMM (Freedom) and TRUPS (Troops), is part of the new NextGen descents, which use satellite-based information to make more efficient arrivals and departures at airports. The sequences contain a series of five-letter waypoints, and together, they spell out messages of support and remembrance for 9/11. Aircraft flying the Freedom route to National from the northwest pass through waypoints named “WEEEE,” “WLLLL,” “NEVVR,” “FORGT” and “SEP11.” Those flying the Troops route from the southwest pass through waypoints named “USAAY,” “WEEDU,” “SUPRT,” “OOURR” and “TRUPS.” Depending on the runway configuration, aircraft might also pass through waypoints named “STAND” and “TOGETHER” or “LETZZ,” “RLLLL,” “VCTRY” and “HEROO." This not the first time a waypoint has been designated to remember 9/11. A waypoint published last year over Shanksville, PA, was named “GARDN” (Guardian) in honor of United Flight 93, which crashed after passengers fought with hijackers for control of the plane and prevented it from reaching Washington, D.C.